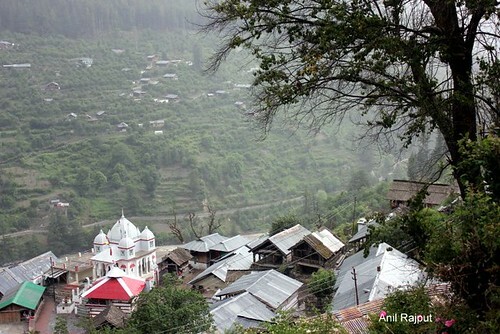 Guptkashi is a village situated at the height of 1319 meters above sea level famous for its Vishwanath temple. 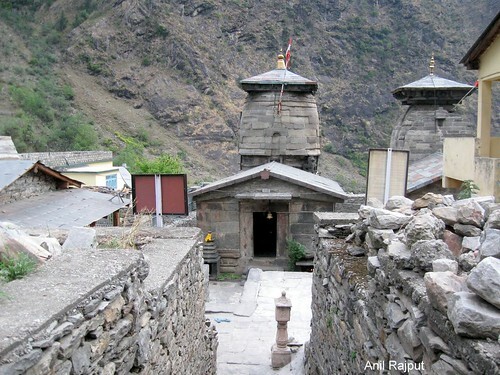 The Guptkashi means the Hidden Kashi , it is on the way to Sri Kedarnath, legend is after the Mahabharat war was over the Pandava brothers wanted to wash their sin of killing their own relatives in the war , they were searching the Lord Shiva , Lord Shiva hide himself at this place . It is also said that Lord Shiva proposed to Parvati here at the confluence of river Son Ganga and Mandakini at Triyuginarayan ( 48 kms) . It is also said that during the Mughal King Aurangzeb period when he ordered to construct the mosque at Vishwanath temple at Varanasi ( Kashi) or Kashi Vishwanath, the original Shiva Lingam was removed from there and brought here to be in safe hiding . According to the old texts the Purans of Hindus the Kashi and Kanchi are the two eyes of Lord Shiva and there are six more Kashi sacred and of equal importance as main Kashi the Varanasi or Kashi Vishvanath , those who can’t travel to main Kashi can reach the nearest one , these are Uttarkashi and Guptkashi in Uttrakhand , The Dakshin Kashi in South India, the Bhubneshwar in East of India , Nashik in Western India ( also called Paithan) and Mandi in Himachal Pradesh. It is built of stone with high tower and a wooden frame with sloping roof , at the entrance there are two guards and walls are painted with flowers , main entrance is also guarded by the Bhairov, on the one side is a temple of Ardhnarishvar the half man and half woman form of lord Shiva , outside this temple is the Nandi bull statue made of metal. It is the temple across the river Mandakini at Guptkashi , it is the winter seat of the Sri Kedarnath , there is a small water pond the Manikarnik Kund two water sources the water is coming out of a mouth of cow is called Ganga the water is coming out of a elephant trunk is called Yamuna , the water falls on the Lingam. There is a Stupa which according to the local legends is a grave of Nala one of the characters in Ramayana , The legend also says that the Anirudha the grandson of Lord Krishna and Usha the daughter of demon King Banasur had affair at Ramgarh ( Ronitpur) this affair led to the war between Banasur and lord Krishna which resulted in as end of the Banasur dynasty. Guptkashi is becoming more important for a night stay on trip to Sri Kedarnath as there are good hotels, guest houses and camps , it is also because of the Phata , Sita Puri and Sirsi helipad , people prefer to stay here. Yatra Chardham in the Uttrakhand also called the Chota Chardham is a journey of four places or Dhams done from spring to autumn months, and as per the Hindu calender, from Akshaya Tritia till the Bhai Dooj ( April end /May first week till October end / November second week) . During this time, all the roads and trekking routes are accessible and free from any Snow. 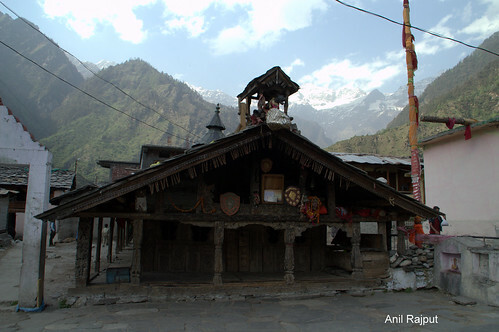 Ma Yamuna is worshiped at village Kharsali seven kms before the Yamunotri main Temple, just across river Yamuna at Janki Chatti, it is a picturesque village which has the oldest Lord Shani temple. Ma Yamuna stays with her brother Lord Shani during the winters. Ma Ganga is worshiped at village Mukhwa near Harsil. A lesser known and ignored fact about Harsil is that Harsil is a place where many rivers meet which forms a Maha Prayag like Vishnu Ganga, Jalandhari, Pawan Ganga, Hatya Harini, Kheer Ganga , Kakora, Tilangana and Bhim Ganga pouring their waters into the main River, Bhagirathi. 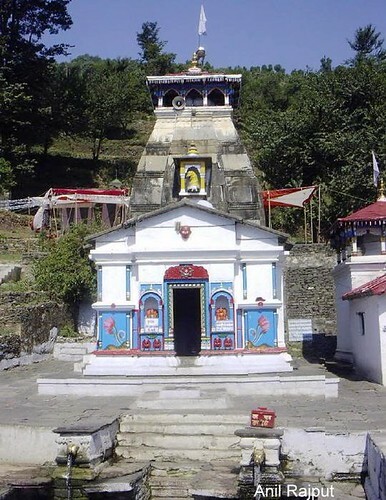 Lord Kedarnath ( Lord Shiva) is worshiped at Gupt Kashi Ukhimath, located on the banks of Mandakini river, where, during the winter months, the Idols are brought in from the main temple of Sri Kedarnath . One gets a beautiful view of Chaukhamba , Kedarnath and Neelkantha peaks. After the curse from a Sage, ( Rishi) Kindama, mistakenly killed by King Pandu, spent his life here and his queens Kunti and Madri gave birth to the five Pandva brothers, Namely Yudhishthir, Arjun, Bheem, Nakul and Sahdev (in order of their ages, elder first). Yudhishthir, Arjun and Bheem were born from Kunti and Nakul, Sahdev were born from Madri. All these places hold equal importance in Sanathan Hindu Mythology, as the main Shrines of Yamunotri, Gangotri, Kedarnath and Badrinath. These places have been the winter seats for these gods for generations.